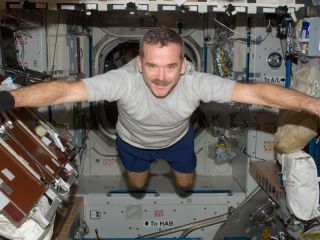 NEW YORK - Famed astronaut Chris Hadfield, Canada's recently retired space traveler, is visiting SPACE.com's office in New York this week and we want to know what you would ask him! Hadfield retired from spaceflight shortly after returning from orbit in May following a months-long trip to the International Space Station, where he served as Canada's first space commander. His new book, "An Astronaut's Guide of Life on Earth" (Little, Brown and Company 2013), comes out Tuesday (Oct. 29). When we webcast our conversation with him on Thursday (Oct. 31) afternoon, we'd love to ask some questions submitted by SPACE.com readers. If there's anything you'd like to know, please tell us in the comments below or in a tweet (@spacedotcom/@meganigannon). During his 21-year career with the Canadian Space Agency, he launched into orbit three times, with some historic achievements for his home country. He became the only Canadian to visit the space station Mir and the first Canadian to walk in space. This past year, Hadfield became first Canadian commander of the International Space Station during his five-month stint aboard the orbiting outpost. During that mission, Hadfield's celebrity status skyrocketed thanks to his viral videos about living in space, which covered everything from clipping your nails to cooking spinach in microgravity. During his last days aboard the space station, he made a music video cover of David Bowie's "Space Oddity," which has been viewed more than 18 million times on YouTube. While he's in New York to promote the book, Hadfield also will be speaking at a public event at the Barnes and Noble in Union Square on Friday (Nov. 1) at 7 p.m. EDT.